This venue was added to our database on July 23, 2003, and the venue's information was last updated 15 years ago. burque.info is responsible for keeping this venue's information up to date. This page has been viewed 4210 time(s). 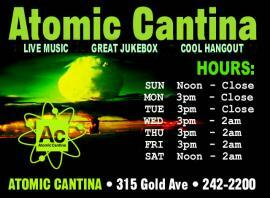 Atomic Cantina was very proud to open our doors on May 5, 2003. We are a new bar located in the heart of downtown Albuquerque New Mexico. The atmosphere of the Atomic is very laid back, all are welcome as there is not a dress code or cover charge. We are a feel good neighborhood bar with a friendly staff willing to get your drinks to you fast. We host live music in the alternative rock vein 3-4 nights a week and 1 day a week on Sunday afternoons for our soon to be famous "Sunday Rock-n-Roll Matinee". The Atomic is located on Gold Street between 3rd and 4th streets in downtown Albuquerque. Our jukebox is stocked with your favorite punk, trance, indie, and rock CD's and there is a pool table and Galaga game for your entertainment. Come in and pay us a visit! Listed below is a schedule of what we currently have going on at the Atomic. Also refer to the event calendar link for specifics on shows. © copyright 1993-2007 by fearstudios.com ( 186204185+103ms ). All Rights Reserved. Report a bug or make a suggestion.